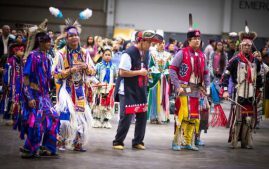 Native Americans from academic institutions and the public and private sectors across the country descended on Oklahoma City for the annual American Indian Science and Engineering Society national conference. From Oct. 4-6, participants from science, technology, engineering and mathematics sectors met and discussed issues in these fields and how to improve the Native American participation rate. CPN tribal member Kaya DeerInWater,who serves the Nation as a botanist and Gtegemen (We Grow It) community garden assistant, is a regular at AISES events. The Lafromboise family descendent credits the organization with providing his first interaction with large groups of Native Americans while studying ecology and botany at the University of California, Davis. The California native described his involvement with AISES as an opportunity to meet Native Americans with similar interests and passions. Attendees enjoy a powwow at the 2018 AISES national convention. DeerInWater’s wife, Kathy, currently serves as the organization’s director of special projects and research. She spearheaded this year’s event. With offices in Albuquerque, New Mexico, and Boulder, Colorado, the organization’s reach is unparalleled for Native Americans involved in the STEM fields. DeerInWater lauded AISES for fostering both the personal and the professional connections he’s established. Through participating in AISES, he met his academic adviser and fellow CPN tribal member, Robin Wall Kimmerer, Ph.D. She is a leading academic in the field of plant ecology and serves as the director of the Center for Native Peoples and the Environment at SUNY College of Environmental Science and Forestry in Syracuse, New York. It’s this combination CPN’s DeerInWater said he holds in such high regard. from government agencies such as the CIA and private sector firms with tribal business experience. Founded in 1977, with a rapidly expanding membership of more than 4,000 members, AISES sustains 190 chartered college and university chapters, 15 professional chapters and 158 affiliated K-12 schools supporting over 55,000 students. AISES has awarded over $11 million in academic scholarships to over 5,000 American Indian STEM students. Through scholarships and internships, workforce development and career resources, national and regional conferences, science fairs, leadership development, and other STEM focused programming, AISES is the leader in STEM opportunities for North American Indigenous people. For complete information on the American Indian Science and Engineering Society, please visit aises.org.